THE RED LINES – in graphic form here. The Mueller investigation releases findings showing significant wrongdoing by Donald Trump. Or Congress or the administration blocks the public from seeing Mueller's findings. 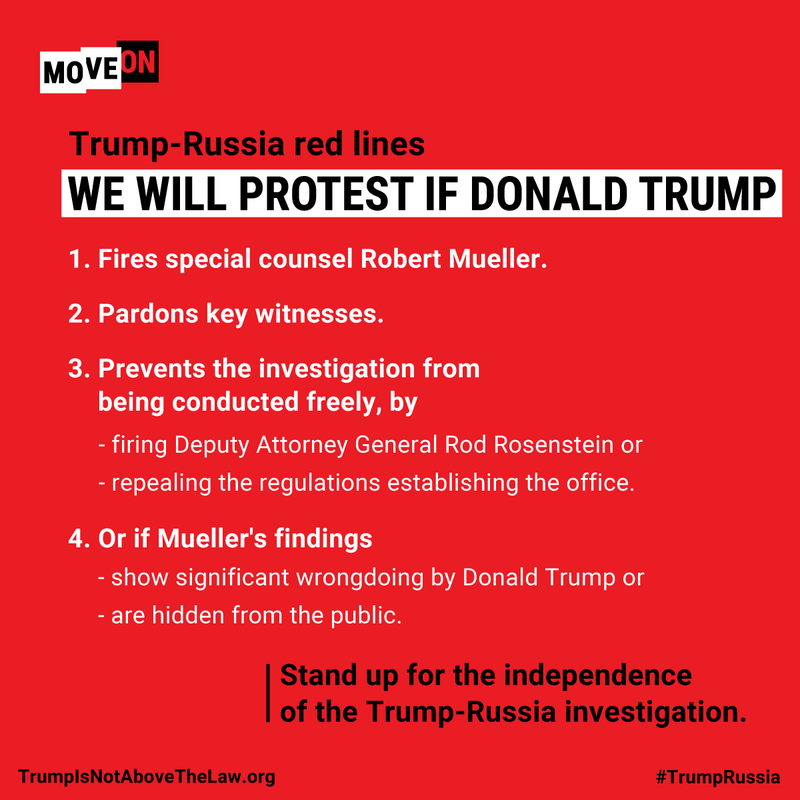 If the Nobody Is Above the Law coalition determines that Trump has crossed a red line, nationwide rallies will be called for 5 p.m. the following day. This timing is an update on the original plan, which called for same-day protests if news were to break early in the day or next-day protests if news were to break later in the day—the overwhelming success of the November 8, 2018 activation, called the day before, prompted the change. This is the general plan—please confirm details on your event page, as individual hosts may tailor their events to their local plan. Should the national network call for events to occur, hosts will be responsible for determining whether, where, and when their prospective events will occur. If there is no date or time listed on a specific event, it is because the network has not been activated and/or the host has not specified if and when the event will occur. Please RSVP so the host team can inform you if they launch their event. These events are only the first step. Our goal with these actions is to create an opportunity for anyone outraged by Trump’s abuse of power to engage immediately in voicing their concern. Together, we will communicate unmistakably that this is not okay and that this act to undermine democracy is not going to be allowed to become a new normal. But that’s only the first step, and it’s far from the last one. Congress is the only body with the constitutional power and responsibility to hold a president politically accountable for major violations of the public trust like this. And “we, the people” are their backstop and source of legitimate power. And what people do next to force Congress to act is up to them! Certainly, everyone at an event should also call their member of Congress to demand action. And everyone is encouraged to communicate that demand directly at congressional offices. Beyond that, it’s up to you! It’s a good idea to discuss possible scenarios in advance with the hosts of your event or with your friends to develop other nonviolent ways you would like to compel actions from Congress. Demand members of Congress protect the special counsel’s office, including preserving its files and staff and ensuring it receives the full cooperation of all federal government law enforcement assets. Demand the creation of a modern-day version of the Senate Select Watergate Committee to investigate all matters involved in the Russia scandals and Trump's abuse of power and obstruction of justice. Demand bipartisan hearings in the House Judiciary Committee on obstruction of justice and abuse of power. Some groups will call these the first steps to impeachment hearings; others will not. Impeaching Donald Trump is not a demand shared by all partner organizations. Nor is supporting impeachment a prerequisite to attend these events. But it is a view welcome at events, and you can definitely bring a poster calling for it if that’s your view. We can all be for the three things above if some of us are also for additional things, such as impeachment.